This is the third story in a periodic series on taxpayer-funded perks enjoyed by government employees. To say that the landscape for public sector health insurance has changed since Act 10 would be an understatement. 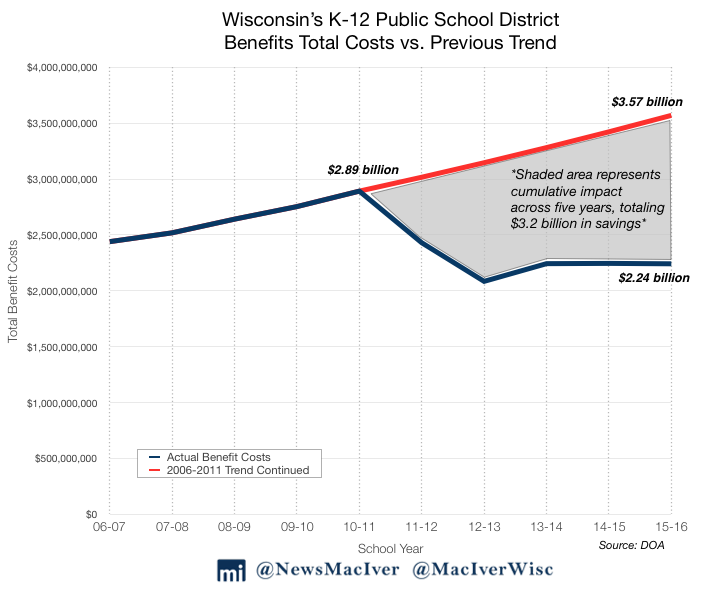 Since the landmark bill’s passage, Wisconsin school districts have saved more than $3.2 billion in benefits costs. Seven years after the passage of Act 10, school districts have saved $3.2 billion on benefits costs. If the previous trend had continued, districts would be paying almost 60 percent more today. Districts found savings by opening up bidding to new insurers for the first time in years, while others increased required employee contributions towards insurance plans. Overall, since 2011, districts have largely moved to more taxpayer-friendly health plans – freeing up more money for the classroom. On the other hand, employees at more than 100 districts – approximately one-quarter of Wisconsin’s 422 public school districts – paid less than 12 percent towards their monthly health insurance premiums in the 2017-18 school year. Still, that’s a far cry from 2010-11, when 43 percent of all districts paid the the entirety of their employee premiums on single plans every month. Today, just 6.4 percent of districts pay employee premiums in full. Across all districts, employee contributions towards premiums average 11.61 percent for single plans and 11.75 percent for family plans. 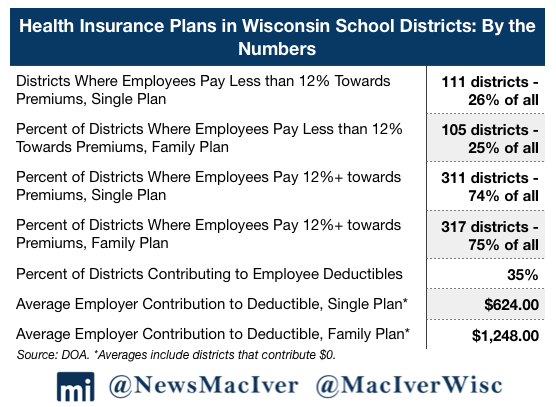 Twenty-three school districts around the state, including Wauwatosa School District, New Berlin, and both districts in Lake Geneva, do not require employees to contribute anything to monthly premiums in either their single or their family plans. That’s according to a new Department of Administration database, which consolidates district health plan information – the first time this information has been collected in one place. The dataset includes figures for 2017-18 employee health insurance plans, including employer and employee contributions towards premiums, deductibles, co-pays, and even out-of-pocket maximums for both single and family plans. Introduced in 2011, Gov. Scott Walker’s landmark legislation required that public sector employees contribute at least 12 percent towards health insurance costs. Those “costs” were most commonly defined as insurance premiums, though increasingly popular high deductible HSA plans were also accepted under the spirit of the law. Ultimately, the goal was to lighten the load on taxpayers, and that’s exactly what happened, according to the DOA. Its estimates show Act 10 saved taxpayers $3.2 billion on K-12 benefits plans alone, primarily in health insurance. That’s with only 74 percent of school districts complying with the 12 percent rule for premiums. Figuring out who’s actually complying with the law has not always been easy, because the 12 percent covers total health care cost – not just premiums. However, using the state’s new database, it’s clear one-fourth of all school districts in Wisconsin offer healthcare plans that require employees to pay less than 12 percent of their monthly premiums. Three-quarters of all school districts require employees to pay 12 percent or more each month. Of the 111 districts where employees pay less than 12 percent on premiums, 73 had reported their insurance data to the state in 2010. About two-thirds of those districts increased their required monthly premium contributions since Act 10 was passed. The rest kept the same levels, or in a handful of cases, lowered their required monthly premium payments for employees. For example, in the 2010-11 school year, Middleton-Cross Plains Area employees paid zero percent towards their premiums. As of 2017-18, they pay 12 percent every month, or $72 under a single plan and $181 under a family plan. Employees receive a 3 percent reduction on premiums if they take an annual physical and health risk survey. No matter the exact method of how districts get their employees to contribute towards their own healthcare expenses, taxpayers no longer shoulder the burden of covering premiums upwards of $1,000 for every district employee, every month, through their careers and into retirement. Prior to Act 10, benefits costs to districts had been increasing by 4.3 percent annually – a trend that, if it continued, would have taxpayers paying almost 60 percent more today. That kind of money adds up, and in many cases, such as in Wauwatosa School District and Milwaukee Public Schools, freed up dollars went into the classroom, to building renovations, and to salary increases. Even so – despite what organizations such as WEAC may say – these taxpayer-funded plans are still very generous. Many districts, including New Berlin and Port Edwards, make regular contributions to employee HSAs. Ten districts continue to have employees pay nothing towards monthly premiums, as they did in 2010. Of the 111 districts where employees pay less than 12 percent towards their monthly premiums, 23 cover premiums in full every month for both single and family plans. More than half of those districts also offer high deductible health plans, which are typically coupled with health savings accounts (HSA). In those cases, employees set aside their own money, pre-tax, to spend on healthcare. That still meets the intent of Act 10 by ensuring public employees contribute towards their own health costs, saving taxpayer dollars and bringing standards closer in line with the private sector. Other large districts whose employees pay less than 12 percent towards premium include Beloit, Madison Metropolitan, Milwaukee, Kettle Moraine, and several others. As the MacIver Institute has previously reported, both Madison and Milwaukee Public School (MPS) employees use sliding scales for premium contributions. MPS employees pay between 2 and 14 percent, depending on salary and type of plan. In Madison, employees pay a percentage based on their role. Food service employees and educational assistants, for example, pay 1.25 percent of their monthly premiums, while teachers pay 3 percent. Administrators pay the most, at 10 percent. The only time employees may reach 12 percent is if they fail to take a district-required annual physical. Failing to do so adds a 7 percent penalty. Some school districts are continuing their generosity at taxpayer expense by contributing to employee deductibles instead of monthly premiums. Thirty-five percent of districts contribute to deductibles, ranging from $150 on a single plan in Weston, to $13,900 on a family plan in Baraboo. On average, districts pay $624 towards single plan deductibles and $1,248 towards family plan deductibles, including all the districts who pay nothing. Still, in the grand scheme of things, only a minority of districts seem to be testing the limits of the 12 percent rule. Two hundred and twenty school districts in the state – more than half – require employees pay between 12 and 13 percent of premiums. Of those districts that reported their health plans in 2010, just two of 145 had the same or higher employee premium levels back then. Others require employees to pay beyond what Act 10 requires. Employees on Wilmot Union’s family plan pay 28 percent of their monthly premiums, while those in Westfield pay 22 percent and those in Neenah Joint pay 25 percent. All three school districts offer various levels of compensation for employees who participate in health screenings or who don’t use tobacco. Health screenings or other wellness incentives are common in school districts. Dozens of districts use some type of wellness assessment to create a premium differential. Those incentives and how they’re structured also vary by district. DePere, for example, uses a “carrot” approach: the district waives its required 12 percent premium contribution for employees and their spouses if they participate in a health risk assessment. Oshkosh Area, on the other hand, uses less of a carrot and more of a stick. Employees there pay 5 percent more if they don’t complete the health assessment. Two-thirds of the districts that contribute to employee deductibles require that those employees pay more than 12 percent of their premiums. Overall, 61 percent of all school districts offer one insurer, and 39 percent offer multiple insurers. Nearly three-quarters of districts are fully-insured, while 14 percent are jointly self-funded and 11 percent are self-insured. Preferred provider organization plans are the most popular, with 36 percent of all districts offering them. High deductible plans are the next most common, at 23 percent, followed by health maintenance organizations at 17 percent. WEA Trust is the most common provider by far, covering 100 school districts. WCA Group Health Trust, Security Health, and Dean SSM Health are the next most popular providers. In all, had health insurance spending continued along its trend prior to Act 10, taxpayers could be paying billions more for public sector health insurance and other benefits that far outpace private sector compensation. While certain gubernatorial candidates are running on increasing school employee benefits to their pre-Act 10 levels, taxpayers may want to take a look at how the game has changed. Indeed, as the numbers show, the sky is not falling. 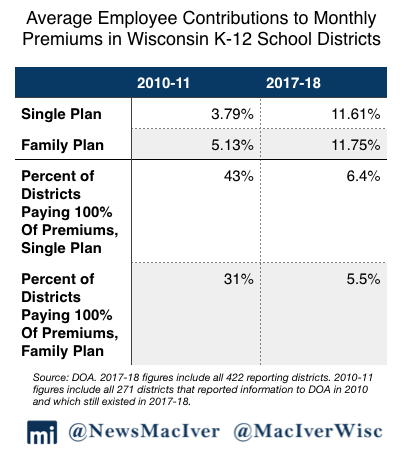 In places like Wauwatosa School District, premiums have fallen by 0.32 percent in the past seven years, and the district still covers all of those premiums for their employees. Compare that with the so-called Affordable Care Act’s premium increases – a staggering 44 percent in 2017. Healthcare in America is far from a free market. But as it turns out, opening up that market to even a little bit of competition has done wonders for district pocketbooks, and in turn, for all of Wisconsin’s taxpayers.